The Prisoner’s Dilemma is the best-known and studied model in game theory. This game is usually taken as an example for illustrating the gap between individual and collective rationality and to prove the dominant strategies when we do not know the course of action of an opponent. It was first formalized by the mathematician Albert William Tucker in 1950 and is very useful in situations in which the result of a certain problem does not depend only on us, but also on the choices of others. 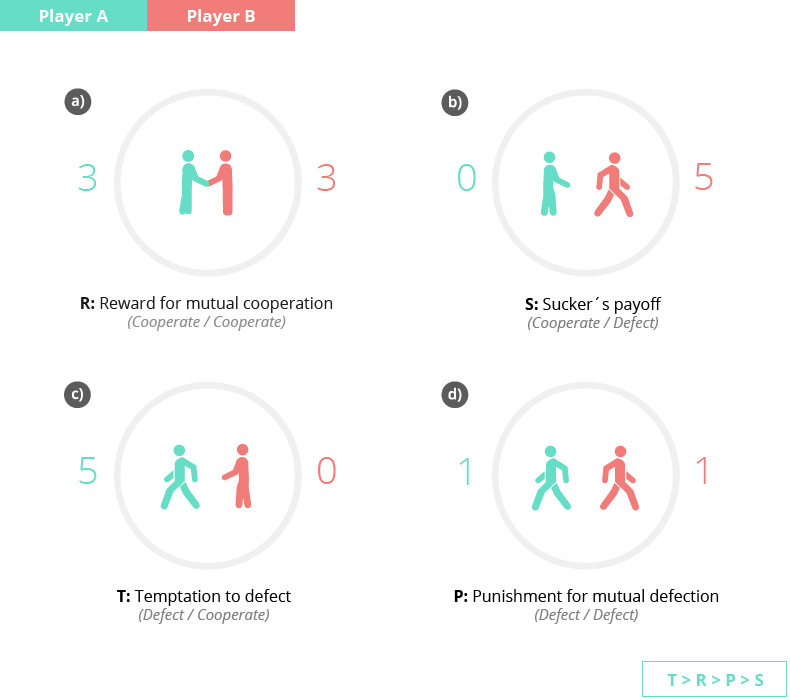 The Prisoner’s Dilemma is a type of non-zero sum, symmetrical and two-person game in which players can choose between two different strategies: cooperate with or defect from the opponent. The DILEMMA (classical example): The police caught two offenders after they committed a crime, but there is no evidence to condemn them. Prisoners are confined in different cells and each one receives the same deal. If one of them confesses and points to his accomplice as guilty, he will be released while the other offender will be sentenced to 5 years in prison. On the contrary, if he denies his guilty while the other prisoner confesses, then the first one will receive such a sentence while the other will be released. However, if both cooperate with the police, each one will be sentenced only to 3 years. If both decide not to cooperate, they do not spend more than 1 year in prison due to the lack of evidence by the authority. The Prisoner’s Dilemma game shows how cooperation requires a commitment from both players in order to obtain mutual beneficial outcomes. Although this approach is a priori quite simple, it is extremely complex and convoluted when we try to analyze human cooperative behavior and the nature of interactions between individuals in specific contexts. Factors such as age, cognitive development, socio-cultural traits, moral and ethical values, knowledge and acceptance of social laws, among others, strongly influence the behavior of individuals. Thus, it is necessary to test and validate the emerging hypothesis on this subject in order to draw reliable conclusions and take full advantage of cooperation as a social phenomenon. This game can be described as a general set of two-players (A&B) in which each one of them can adopt two actions or choices: cooperate or defect, to obtain a final payoff that depends on her choice and on what the opponent decides to do (as shown in the four panels a, b, c, d in the schematic representation below). This image can be freely used provided that credit is given to this web site. Note that in the clasical example above, to cooperate with each other means ”not confess”, while to defect (i.e., to betray each other) is equivalent to “confess”. Unilateral defection provides the highest payoff for the defector (player B in panel b or player A in panel c). Unilateral cooperation results in the lowest payoff for the cooperator (player A in panel b or player B in panel c). Nevertheless, in terms of collective payoffs, mutual cooperation reports the highest payoff, as it results in a payoff of 3 for each cooperator, so the total amount is 3+3=6. (See panel a). On the contrary, mutual defection gives the lowest payoff, i.e., 1+1=2, (See panel d). The benefits obtained when both prisoners confess (betray each other) is less than the benefit they would have obtained if both would have remained silent (cooperate). The dilemma then comes from the fact that from an individual perspective, the best course of action is to defect, because whatever your opponent does, you will never earn less than her (5 and 0 if you defect and your opponent cooperate; or 1 and 1 if both defect). But, in a fully rational population, everybody will think in the same way, and all players will end up playing as defectors. However, mutual cooperation would have led to maximizing social welfare. If the other player cooperated, I would earn more benefits if I did not. If the other player did not cooperate, the best thing for me would be not cooperating either. However, mutual cooperation is better than not cooperating unilaterally. That is the dilemma! They are dilemmas in which each individual seeks to maximize his profits capitalizing on the group performance or collective action. There is a group of 6 individuals, each one with 10 Euros. In each round of the game, each individual can contribute to the public good with any amount between 0 and 10 Euros. At the end, the bank will triple (x3) the amount collected from all and divide it among the group members. Individually, the best option is to contribute nothing, because if the other participants do not cooperate, every euro would generate only 0.5 Euros (3×1/6). Nevertheless, the best collective strategy would be that each participant provides an amount of 10 Euros, because so the profit would be the maximum for everyone: 3x10x6/6 = 30 Euros. There is a group of 6 individuals involved in this experiment that should achieve a common goal: contribute to the prevention of climate change. Each individual begins the game with 40 Euros. They must play a total of 10 rounds and in each round; everyone can contribute to the public good with the following amounts: 0, 2, or 4 Euros. If at the end of the game, a minimum amount of 120 Euros is collected among all the individuals, the common goal will be reached and therefore, everyone may keep the savings. 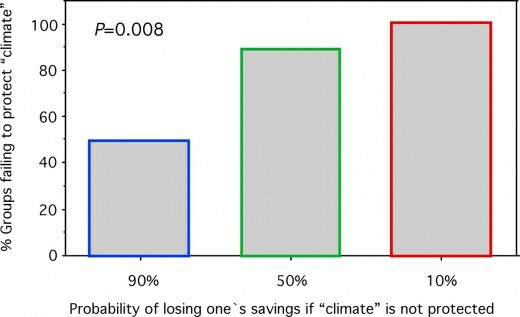 Otherwise, they can lose everything saved with a given probability. (See figure below). Figure taken from M. Milinski et al., PNAS USA 105(7):2291–2294 (2008).